Lively stands accused of helping to play a part in the persecution, arrest and murder of gay people in Uganda. Lively’s lawyers requested to dismiss the lawsuit, but now a federal US judge has ruled a persecution of LGBT people is indeed a crime against humanity and that Lively must stand trial. ‘The history and current existence of discrimination against LGBT people is precisely what qualifies them as a distinct targeted group eligible for protection under international law. Frank Mugisha, director of Sexual Minorities Uganda, said: ‘Today’s ruling is a significant victory for human rights everywhere but most especially for LGBTI Ugandans who are seeking accountability from those orchestrating our persecution. 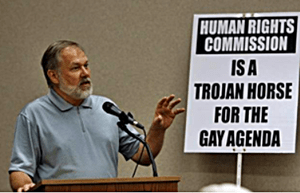 Lively the founder of Abiding Truth Ministries, an officially recognized hate group has made a career of stirring up anti-gay feelings in the USA and across the world. In 2007, Lively also toured 50 cities in Russia where he is accused of recommending a ban on ‘gay propaganda’ and in 2011 was a driving force is pushing Uganda’s anti-gay laws. NOTE: Its been brought to my attention that this event actually happened in August of 2013. But no matter when it happened did we know about this? Video – White House Has No Comment Over Prop 8 Ruling ….. SURPRISED? It’s about time. I bet you all the others eg, FRC AFTAH, AFA et al, won’t make a sound until Lively is convicted. thank you for sharing this.. I hope it actually helps all other countries where this is starting to replicate and expand to eventually be countered and defeated. The world has enough real issues without people creating new ones out of fear and hate of any form. All that energy globally being put towards this stuff could solve global issues rather than create them. God is really going to have words with Scott Lively on Judgement Day. I am not sure about anything coming from these charges, however, because the defense will say that he was practicing his freedom of speech and religion and that the government and people chose to listen to him. RE: But no matter when it happened did we know about this? Pingback: Scott "Crimes Against Humanity" Lively: It's Time For A Christian War Just Like In The Bible!